This is an old recipe from Kraft, but I updated it by using their new caramel bits instead of the caramel candies that have to be unwrapped. I also added some chocolate chips and some forgotten chocolate bunny to the filling, where it did indeed melt as I put the hot caramel on, but baked up surprisingly well without compromising the flavor of the caramel much, which was my concern. It might have even enhanced it. However, you can leave the milk chocolate out of the filling and just scatter chocolate chips or chopped milk chocolate on at the end if you’re a purist. Mix the flour, oats, salt, baking soda and brown sugar together in a mixing bowl. Add butter and stir with a spoon or mix with fingers until mixture is thoroughly mixed – dough should just start to come together. Reserve a little less than half of the mixture and put it in the refrigerator. Press remaining oat mixture into bottom of pan and bake 10-12 minutes or until set. Let cool for at least 15 minutes. Note: If you are going to use the milk chocolate, sprinkle it on when the base is fully cool. Make caramel filling. In a microwave-safe bowl, melt the butter. Add the caramel bits and stir to coat with butter. Microwave on high for 30 seconds. Stir and repeat until caramel is melted. Stir walnuts into caramel. Pour it over the base (this is when some of your chocolate will start to melt). 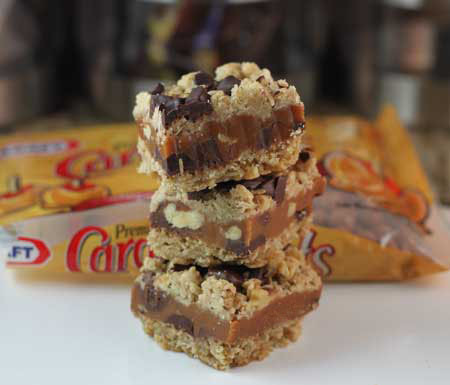 Caramel and oats are wonderful together–these look delicious! Love the layering in there! Your bars look yummy! That caramel layer looks sooo good. I might toss in some peanut butter chips…but oh my gosh do these look yummy! These look great! is there a better combination that oats and caramel?? These look so good. Love that really thick middle of caramel. These bars look amazing! I’ll be trying these for sure. Tara, the two reasons I can think of are that a) you are overcooking it or b) the recipe just needs to have some cream or butter added. For instance, in this recipe the butter helps keep the caramel from getting too chewy. Jan and Laura, thanks for letting me know! Jan, I don’t usually post chicken salad but I liked that one a lot. Thanks for trying it and posting a review. Love these delicious looking treats. 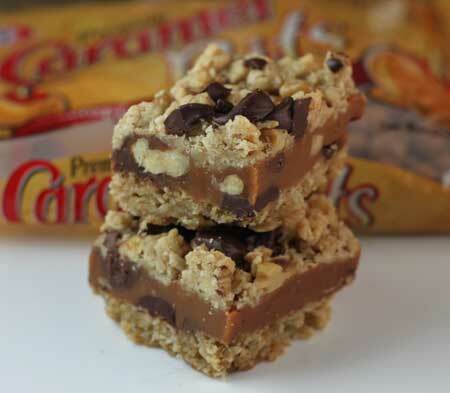 I love caramel in treats, too. Love how nicely cut yours look with a perfect layer of caramel. Another comment unrelated to your awesome looking bars… Thanks for the pan advice on Texas Seet Cakes. I one this weekend (adapted a bunch of recipes), and it came out perfectly! This has nothing to do with today’s recipe, but I made your bridesmaid chicken salad today and I must say it is pretty amazing. I used just a hint of curry, but followed the rest of the recipe as you wrote it. I love it and can’t wait to serve it to a friend that is coming over later today. It is different from any chicken salad I have made before. The lemon and lime stand out to make it light and refreshing. Thanks for your many wonderful recipes. I love caramel in dessert bars! These look great!